A new MIT online dating service is in the works for Valentine’s Day. But unlike last year, the new service will be anonymous, and its organizers will not participate, said Mandeep Singh ’05, one of the organizers. Last year’s service, designed and run by Jonathan G. Monsarrat ’89, attracted more than 3,200 participants from MIT, Harvard, and Wellesley. 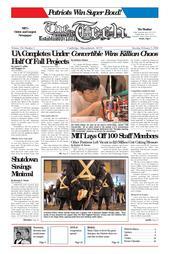 Some Harvard students later complained to MIT and the Harvard police about e-mails they received from Monsarrat, who, in addition to running the service, participated and matched himself up with more people than any other participant, he said. The new matchup will be available to students at all Boston-area colleges, Singh said, and is planned to open later this week. The organizers will announce the service’s Web address when the matchup is ready, Singh said. This year, the service will not give participants the names of their matches -- instead, it will allow them to contact their matches anonymously, Singh said. Monsarrat will not be involved in running the service, both Singh and Monsarrat said. “Because I won’t be in the administration anymore, any lingering doubts people might have about this won’t be there anymore,” Monsarrat said.